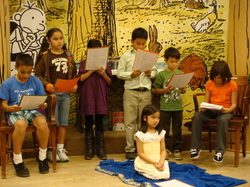 In this photo, the students are performing a Native American skit at the first annual Barnes and Noble Book Fair. For this particular assignment, the students were given the script. These students collaborated as a group to create this performance. They were required to stage the skit, design their props, and act it out. They took much pride in this project and did an exceptional job working on the script and making it their own creation. The students were empowered to be leaders in their learning, which resulted with a creative and successful performance! As reflective practitioners, it is important for the school community to review the vision and mission of a school. 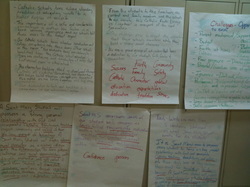 A team of teachers, parents, and volunteers collaborated to revise and edit the vision and mission statements of the school. Below you will find the revised statements for St. Mary School. St. Mary students will possess a deep personal relationship with God. and values in their quest for knowledge as life-long learners. leadership, and teamwork within the global community. are committed to our Catholic identity. religious activities, and faith-filled experiences in a safe environment. To develop leaders, it is important to teach and model the qualities and skills of a leader. As a teacher, I am naturally in a position to lead. I am required to guide my students through their lessons and must point students in the right direction when making decisions. As the old saying goes, I must “lead by example.” While each of these things are important, I have also learned that being a leader also means learning to follow and allow others to lead you. One way to be a leader who is equally a follower is through servant leadership. Servant leadership focuses on the well-being of others rather than oneself. In various undergraduate experiences (retreat committees, immersion trips, and Jesuit Volunteer), I learned the value of humility and the ability to allow others to lead. It is important to ensure that others are heard, and everyone is valued. I think that has truly influenced me as a teacher. I can recall situations in which I have thought, “My way of doing things is correct,” or “I must have the absolute answer,” when students have asked questions during discussions. I have since learned that my students are valuable sources of input, as are parents and colleagues. I have also learned that when I take my students’ ideas and needs into consideration, I am able to create a positive and empowering classroom environment that engages my students. Working with students is a good way to establish a healthy and positive climate in the classroom. By doing so, students can succeed in a community where they feel supported. Thus, leadership also requires the ability to be a servant as well. One important characteristic of a leader is that of responsibility. In order to build students of character and empower them to be leaders, it is crucial to teach students how to be responsible. For this assignment, students brainstormed ways to be responsible and create a web of ideas.